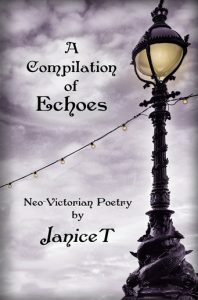 Step back in time with this collection of rhyming verse, containing the first three books of the Echoes, Neo-Victorian Poetry series. Trained from a very early age by the tomes of Classical, Edwardian, and Victorian era poets, Janice T puts a 20th century spin on rhyming, metered poetry. Within the rigors of her restrictive, classical template, the challenge is to give the appearance of effortless composition. It is this challenge which has served to fuel, rather than stymie, her muse. You are invited to steep a lovely cup of tea, find a cozy niche, hope for a rainy day, and indulge in the resonant ambiance of A Compilation Of Echoes. Janice T has been writing poetry for more than fifty years. She composes tightly woven, unforced, rhyming, metered verse. Much of her poetry hearkens back to the influence of the English Lake District poets, which is apparent in her contemporized writing style.